Located within the 16th Street Historic District, the project combines two existing brutalist office buildings into one cohesive elegant “whole” that is both contemporary and also belongs within its context. 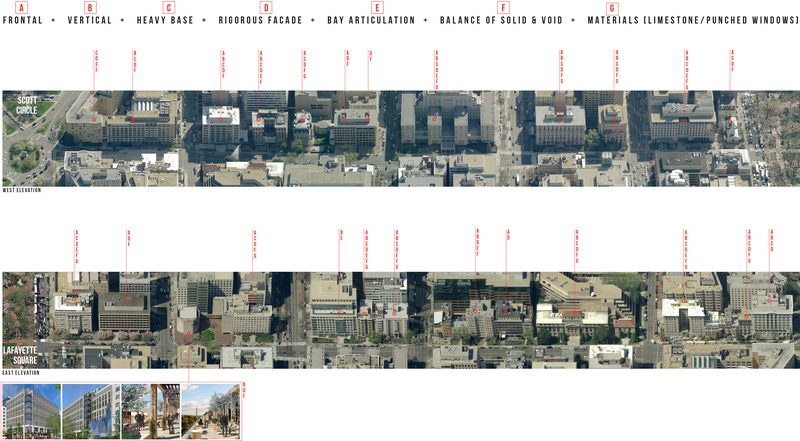 Identifiable qualities give this District its unique character: (1) buildings are frontal to 16th Street, (2) they have a vertical “grain”, (3) and a heavy base, (4) facades are rigorously composed, (5) bay articulation is used, (6) there is a strong balance between solid and void, (7) and prevalent materials are limestone and punched windows. Our design proposes the use of bays as an intermediate scale that mediates between the overall mass and the texture of the window pattern, framed by sculptural piers. The three sculptural bays sit on a heavy perspectival base that balances the overall composition. Obliquely, the design fulfills the historic district “needs” for solidity; while frontally, it provides the important tenants’ “wants” for transparency. THE VARIATION IN THE SCULPTURAL PRECAST CONCRETE PIERS ARE THE RESULT OF THE INTERSECTION WITH THE WARPED BAYS, ORIENTED TO CAPTURE THE BEST VIEWS.